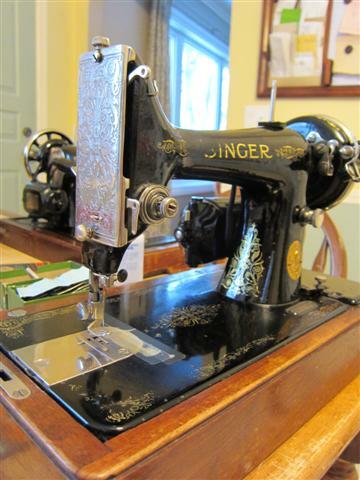 I've always been interested in vintage sewing machines. This week I was lucky enough to find two beauties on the local kijiji for a song. My husband was kind enough to drive across the city in opposite directions to pick them up for me. He's enjoyed helping me get them running again, and boy are they lovely! Quiet, sturdy and elegant. Does it get any better? Yes, actually it does. They each came with a selection of feet including rufflers, edge stitchers, tuckers etc. Fabulous! They have bentwood cases with working keys, too. They do not have foot pedals or treadles or hand cranks. There is a bent lever sort of like a crow bar that fits into a hole on the front of the base of their wooden cases. This gets pushed to the side by my knee and the farther I push it, the faster the machine goes. How cool is that? I'd never seen machines run this way before. I really love them. Here they are, the Ladies! On the right is the one I have named Ethel. 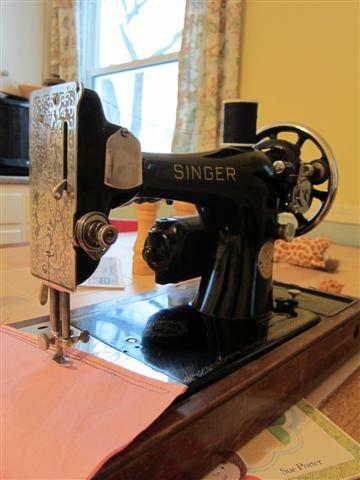 She's a model 128-13 from 1948, made in Quebec, Canada. Original retail price was $79.50. The receipt came in the accessories box. The internet tells me this would be about $733 today. Wow! She runs really well and my husband made a new electrical cord with a switch. Very nice! We are going to order a replica hand crank for this one. The kids are really interested in trying it out and it would be safer/easier for them this way. This one is a model 99k from 1927. I've named her (can you Kit fans guess?) Aunt Millie. This one is great too, we are going to keep the electric motor. 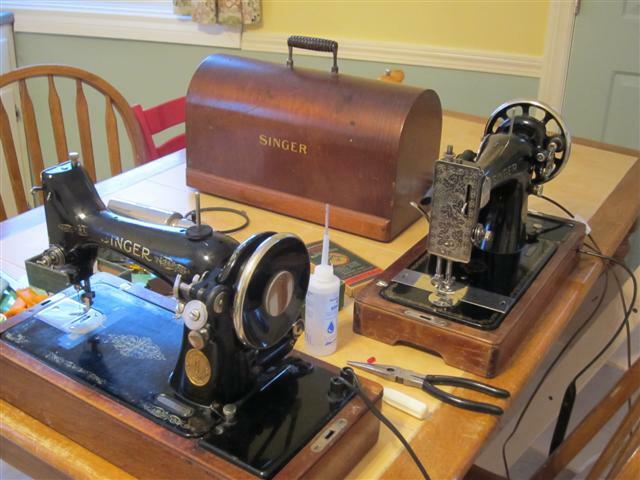 After oiling and adjusting both of these machines they are really nice to sew with. I'm excited to try out the various feet they came with. I've also ordered some vintage patterns to make myself some retro fashions. It just seems like the right thing to do. Also because our house was built in 1947, it's like these machines belong here. I'd like to make Kit and Molly some things with these, too. They are both 3/4 size machines. Aunt Millie's wood case is in better shape despite being older.